On this day in 1988, nationwide pro-democracy protests erupted against General Ne Win’s Burma Socialist Programme Party, beginning a period of demonstrations, demands for democracy, unrest, and severe crackdowns in the Southeast Asian nation. It is known as the 8888 Uprising. Since 1962, Burma (now Myanmar) had been a one-party state ruled by General Ne Win and his repressive Burma Socialist Programme Party. The party’s ideology, institutionalised in the Burmese Way to Socialism, combined Soviet-style central planning, Buddhist beliefs, and superstitious decision-making to disastrous results: almost every industry was nationalised and Burma quickly became one of the world’s poorest countries. Unrest stirred for years, spiking in response to Ne Win’s policies. In 1985 his government withdrew Burmese local currency notes, leading students to boycott the decision. In 1987 Ne Win withdrew the newly replaced 75- and 25-kyat currency notes, leaving only the 45- and 90-kyat notes because the latter two are numbers divisible by 9, which Ne Win considered lucky. Students were particularly incensed by this decision, which wiped out their savings for tuition fees. More protests, led by students of the Rangoon Institute of Technology, erupted and quickly spread throughout the country. As the military cracked down and killed some protestors, an underground movement developed and a larger, nationwide protest was planned. 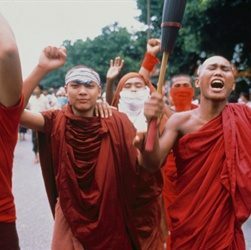 On 8 August 1988, hundreds of thousands of university students, monks, children, housewives, and physicians around the country demonstrated against the regime in a protest known as the 8888 Uprising, so scheduled for the supposedly auspicious characteristics of that date, 8-8-88. The protests were among the bloodiest in history, with the government brutally cracking down on protestors by shooting straight into their ranks—and protestors fighting back with Molotov cocktails, swords, knives, rocks, and more. “If the army shoots, it has no tradition of shooting into the air,” General Ne Win famously told his troops during the uprising. “It shoots straight to kill.” Though authorities in Burma put the casualties at 350, outside estimates range up to 10,000. The protests, which continued into September, also saw the resignation of Ne Win and his successor, the similarly disliked “Butcher of Rangoon,” Sein Lwin, and the emergence of Aung San Suu Kyi, daughter of independence leader and father of modern Burma Aung San, as a leader in the movement for democracy. But hopes for democratically elected government were dashed when on 18 September 1988, the military regained power in Burma through a bloody coup that saw General Saw Maung establish martial law, impose more draconian measures, and continue the violent crackdown on protestors. Today, the 8888 Uprising is honoured and memorialised by Burmese expatriates and citizens alike and Aung San Suu Kyi, who was released from a nearly 15-year house arrest in 2010, continues to lead the country’s democracy movement.